Eduard Brunner was, right up to the end of his life, vitally active as a soloist and teacher and a perennial fixture on the music scene over decades. 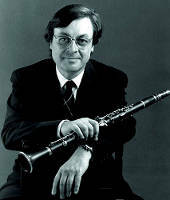 Eduard BrunnerAs far back as 1983 Eduard Brunner championed the revival of the early Romantic era at the ORFEO label with the clarinet concertos of Carl Maria von Weber; employing exemplary skill with his instrument’s richness of expression, he produced the finest of nuances, finding just the right tone whether for the melancholic and elegiac or for high-spirited exuberance and humour. An undisputed leading performer in his fach, he had for many years played around the world with the best musicians on other instruments and true to his declared passion for contemporary music, premiered many new works (and performed them repeatedly). As a result of his early artistic success he also brought to the music scene a wealth of experience connecting to the great musicians of the past. His enduring presence on the concert stage and in the studio was enhanced by his eternally youthful agility, his intellectual flexibility and his wit, and his fun-loving disposition almost made one forget his real age. His tremendous knowledge was impressive, especially in this day and age; he was knowledgeable on so many levels, not just on music, and knew so many detailed and well-researched facts. He was an intellectual of untiring inquisitiveness, his vibrant curiosity was infectious. This was accompanied by an immediate sense of humour which produced the kind of heartfelt laughter that people felt they could share with this modest artist. Indeed, one might say he had everything to laugh and smile about, with his talented musicianship and intelligence.